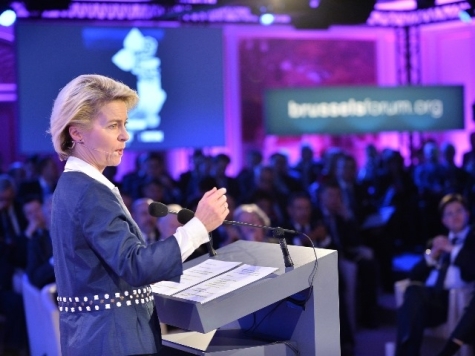 BRUSSELS --- Statement by Dr. Ursula von der Leyen, Federal Minister of Defence, at the 10th Brussels Forum of the German Marshall Fund “(R)Evolution” on 20 March 2015 in Brussels. What do we see when we look at the current security situation? A historian, having the advantage of hindsight, might one day say that we are in the midst of a sustained evolution as regards security. In contrast, contemporary witnesses consider that they are in the middle of a revolution since 2014. A revolution in the global security challenges, similar to the one after 9/11. Ukraine, Russia, ISIS and the phenomenon of hybrid warfare – you know the catchwords. It is clear that we need to act. Indifference is no option for any of us. While there is a lot to talk about – and you can see this from your programme –, I would like to focus on 4 points. Is this a new phenomenon, or is it “as old as the hills”, as the IISS in London believes it to be? The means – covert operations, propaganda, economic pressure and subversion – may be that old. But the intensity, orchestration and way in which hybrid strategies are applied today is new. Look at Russia in the Ukraine – a serious breach of international law accompanied by a disinformation campaign finding its way deep into Western media. And look at ISIS, destroying the structures in Iraq and Syria – with propaganda also finding its way deep into our Western societies and social media. • and democracy And so we are the ones WHO must find answers for ourselves. In NATO, we are doing our homework: With the Wales Summit, the Alliance has adapted to the new situation and made some decisions. We are now working on the implementation – You know the buzzwords: Spearhead, logistics bases so called NFUI’s, the high readiness headquarters in Stettinn. And in the European Union, we can see that Europe is anything but “a weak colossus in security and defence matters incapable of taking action,” as IT has been alleged to be many times…. …and as President Putin expected IT to be. Instead, we can see that in the sanctions against Russia, the EU holds a very strong economic tool in its hands. Economic power also happens to lend power in security matters. But we have to strengthen our tools in the field of security and defence policy: We have to establish new priorities in the Common Security and Defence Policy: I know, we are implementing the conclusions of the European Council 2013 and revising the European Security Strategy. But we have to go further: I think that the Treaty of Lisbon has a great deal of potential - we just have to use IT. Europe will only stay politically relevant in the future if we are able to complement our economic power and our political influence with a truly common security and defence policy. But let me underline: The times have passed, in which there was a difference between European and transatlantic thinking. The strengthening of European Defence capabilities strengthens both NATO and the EU. Well, Jean-Claude Juncker has cited an important long-term goal. We must set ourselves goals, well knowing that there is still a very long way to go and many steps must be taken to get there. But without ambitious European visions, There is a high risk to fall back, to take Europe for granted, blame IT for its bureaucracy and perpetuate nationalism. • and a common currency. I am therefore convinced that a common army can also be created; IT is a long-term necessity and a logical consequence of European integration. Critics routinely object that a European Army would threaten transatlantic cooperation. The opposite is the case! Our transatlantic partners rightly want us to do more for our own security! They require us to contribute more towards solving crisis and conflicts around the world. And so we are strengthening the European capabilities with our Framework Nations Concept. More and more European states are are integrating parts of their armed forces. If all of these measures bring us closer towards a stronger European Defence and Security Policy – IT is good for Europe, good for the Transatlantic Partnership and good for the Alliance. Fourth point: The practical consequences The Bundeswehr has already taken important steps in this direction: For example, with the Franco-German Brigade, which became operational some 25 years ago now and was most recently deployed in Mali. Another is the permanent assignment of the Dutch airborne brigade to a German division. We have reached agreement with the Netherlands on applying this model to the navies – maybe then, with the assignment being the other way round. A true beacon of integration in Europe! This is a sign of deep trust among two neighbours WHO for centuries were separated by a gulf of enmity and WHO are today united in friendship. We are also planning to build up a multinational tank battalion in the Bundeswehr and a multinational helicopter unit. I am sure that this is just the start across Europe. To sum up: What is Germany’s role? What is our ambition? I described this role as “Leading from the centre” at this year’s Munich Security Conference. Germany is a strong partner in Europe. We are the biggest European economy, we know about our political weight – and we have one of the three largest armed forces in Europe. We are and we will stay engaged in the process of shaping a genuine European Common Security and Defence Policy – as we are engaged in strengthening NATO. This kind of leadership means to invest more in cooperation projects than other nations – politically, militarily and financially. If IT is true that Europe will only remain relevant in the field of security and defence, if IT takes close cooperation and integration of its armed forces seriously that the United States expect a significant contribution to peace and stability in the world from us that in spite of all differences, Europe has more in common in the field of foreign and security policy than not. And if IT is true, that the beginning of each grand project – including the long-held dream of a truly unified Europe – is an almost unimaginable vision, then IT is time to take the right steps now! We don’t want to start a short-lived revolution. Now is the time to take the right steps towards a long-term evolution in the field of security policy. I am convinced: A European Army makes Europe stronger, not weaker! And IT makes the transatlantic Alliance stronger, not weaker.